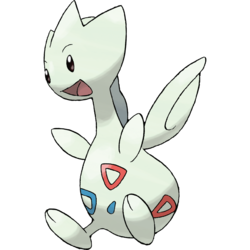 Togetic in game: 445 Who? Important notice! 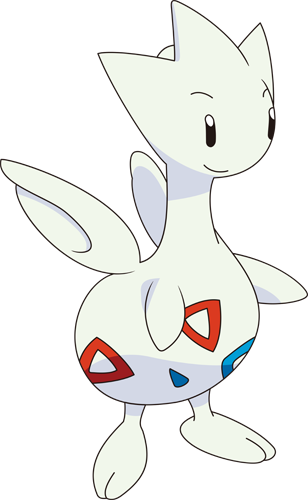 Pokemon Togetic is a fictional character of humans. 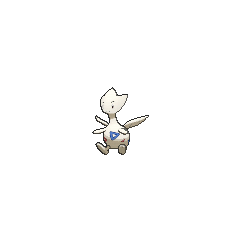 A Coordinator's Togetic appeared in Playing the Performance Encore! participating in the Battle Stage of the Daybreak Contest along with an Ivysaur. Prior to the events in Gligar Glide of Volume 9, Jasmine left two Togetic in the Pokémon Day Care Center near Goldenrod City, which they first appeared silhouetted in Gligar Glide. The Egg that was born from them was passed on to Professor Elm for research, who then passed it on to Gold. The Egg eventually hatched into Togebo, a Togepi. 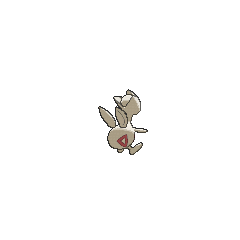 In The Last Battle XIII a Togetic was one of the Pokémon sent to help the fight in Ilex Forest. 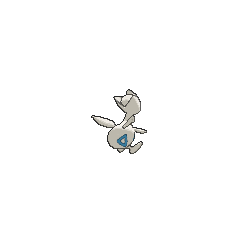 A Togetic appeared in Skirting Around Surskit I as a rental Pokémon that Guile Hideout stole. 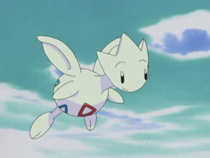 In All About Arceus VIII, Togebo evolved into a Togetic and right then into a Togekiss, due to the Shiny Stone that Lance gave him. Increases damage done by any Fairy types in a combo. 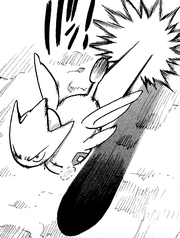 As of Generation V, no other Pokémon has the same dual Egg Group—Flying and Fairy—as Togetic and its evolution. As of Generation VI, no other Pokémon have the same type combination as Togetic and its evolution.